Led offensively by Bobby Hull, Stan Mikita and Bill Hay, the Chicago Black Hawks were a force to be reckoned with in 1960-61. Longtime Leaf Tod Sloan – now in his third and final season in The Windy City – contributed an additional 34 points for the cause, with the Hawks eventual Stanley Cup champions, defeating Detroit in the final, 4 games to 2. 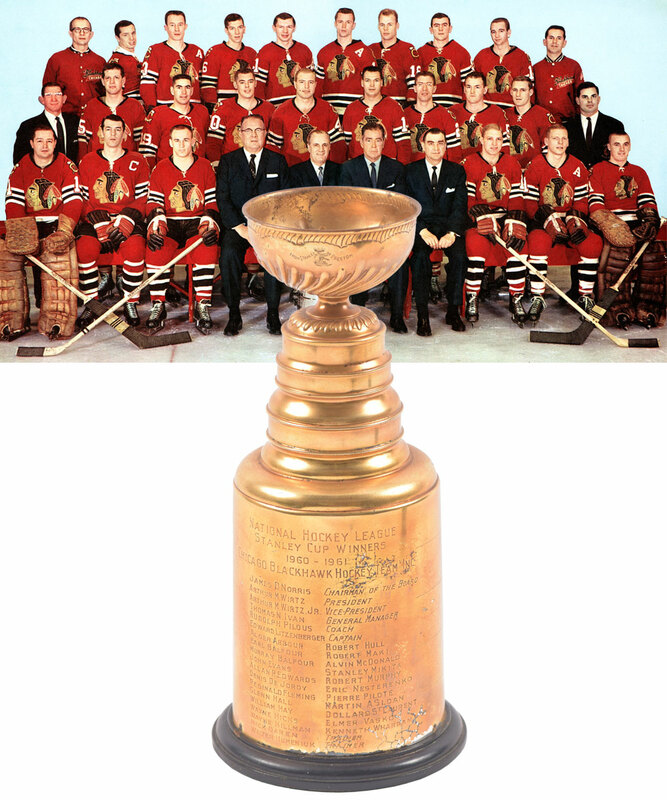 We have a wonderful 1960-61 Stanley Cup championship trophy that was presented to Tod Sloan. 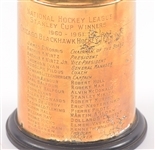 Standing a majestic 13” with a wooden base with green felt underside (currently detached but displayable), the names of the men who made it happen are engraved in two columns, with “1960-61” and “Chicago Blackhawk Hockey Team Inc” engraved above, along with "Petersen" and "E.P.O.C." engraved over the reverse. Displayed in the Sloan home for over half a century, the trophy has acquired a golden hue/patina, with the choice to clean and bring back the original silver surface left to the winning bidder. An LOA from the Sloan family will accompany. As mentioned, the original wooden base is detached, but the trophy can still sit properly mounted as first issued, with this an easy fix. Some crazing to the surface/patina is also worth noting, with this visible in a few spots over the engraved text. There is also some wear to the green felt along the underside of the base.